Ray Bradbury once said that we travel for romance, we travel for architecture, and we travel to be lost. Whatever the reason that makes you pack your bags and set on a new journey is the rule remains the same: always prepare for the next trip. Today companies related to travel, tend to invest more money in travel website development knowing that travelers prefer booking tours, hotels, activities on the Internet. In 2018 online travel agencies captured 39% of the US digital booking market alone and are expected to reach 41% in 2020. According to Allied Market Research, the global online travel market is estimated to reach $1,091 billion by 2022. Among world online agencies Expedia and Booking Holding dominate in the travel agency business. Popular Orbitz, HomeAway, Trivago, and CheapTickets belong to Expedia Group. In 2017 the last with its subsidiaries generated $10.06 billion in global revenue. Booking Holdings, which owns Kayak, Momondo, Cheapflights, OpenTable, suppressed its rival that year with global revenue of $12.68 billion. The travel business is very versatile. It is represented by tourism niches that will satisfy even the most sophisticated travelers. There is medical travel for people who need to improve their health condition. Shopping travel attracts buyers and fashionistas from all over the world to the outlet hubs. Energetic, active travelers who can’t imagine their life without sport will be impressed by the opportunities offered by sports tourism. Today continually changing needs of travelers provoke to appear even of the most exotic niches like travel for people with special needs or travel with pets services. In this article, we are going to give our insight into travel website development. We will highlight the proven business models and show how they work by the cases of the most significant players in the market. We will also talk about an MVP and its business value. Finally, you will know how much it costs to create a lucrative travel business. Online travel market is thriving. eMarketer predicted digital travel sales increase worldwide by 10.4% to $694.41 billion in 2018. That means you can’t do without a web sales channel here to get a piece of the industry pie. In a broad sense, a travel website is dedicated to travel booking offerings, trip fare comparison, and contains cognitive and entertaining content for travelers as articles, guides, and visuals. You may wonder, where to start your online travel agency website development, how to find a unique market niche and what features to use to reach the level? First things first, let’s discuss the most popular types of travel websites. Today’s online travel market has various solutions aimed to help tourists on each step of their journey starting from the search for a place to stay to booking an exotic sightseeing tour. Depending on the travel needs of people preparing for a journey or on arrival each travel website is dedicated to its specific mission. The journey begins when a traveler has chosen a destination and searches for the most convenient way to get there. Transport search engines are resources where every traveler can compare options of several routes depending on the mode of transport, fares, connection flights, or intermodal connections. Ex-Microsoft software engineers Bernhard Tschirner and Dr. Michael Cameron launched rome2rio.com in 2011 to make up for the absence of a fast and easy multi-modal search engine with global coverage and were right. Vast long-distance and local journey planning possibilities make this platform popular far beyond home Australia. Image 1. Multimodal transport search engine Rome2Rio. The highest value of flight search engines like Skyscanner, ClearTrip and Momondo is their comprehensive fare comparison by date, time, price, and class from thousands of airlines worldwide. Online travel providers understand tourists’ need to find a good hotel. They bring together travelers and hotels through the hotel booking websites. Such services allow choosing accommodation for any taste starting from cheap and modest hotel rooms to the most luxurious apartments and get the best hotel booking deal possible. Booking.com was launched in Amsterdam in far 1996 and taken over by Booking Holdings in 2005 is an excellent example to be followed. It is a world leader in the online travel market with over 29 mln listings worldwide with 94% of total Booking Holdings’ turnover. The customers value its affordable pricing, exclusive offers, and broad geographical coverage. A good way to stand out from the competitors and win the market share is to innovate a new approach what Brian Chesky and Nathan Blecharczyk did in 2013. 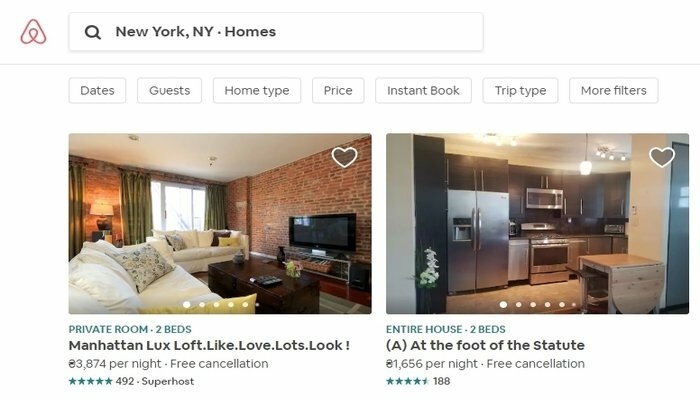 Airbnb disrupted the travel industry turning hospitality into the new way with sharing economy in its core. Image 2. Online marketplace and hospitality service Airbnb. Couchsurfing, in its turn, enables travelers to kill two birds with one stone. With home exchange websites they can save on hotel by choosing a homestay and get a unique travel experience diving into locals’ cultural life. As you can see, everybody can find their way to do business. Food is the stuff everybody absolutely needs. Restaurant booking websites work for travelers and public catering providers as an online network connecting reservation-taking restaurants and people who want to dine there. Tourists can make a reservation in advance even if they are on the other side of the world and restaurants get entirely sold-out. OpenTable surely can be called a monopolist among online restaurant reservation services. Its owners see its mission in enabling travelers to find and book for free the perfect table for every occasion. Launched in San Francisco way back in 1998, the service was available in the United States only, however, for the last 20 years it extended its geography to Europe, Latin America, and Australia. OpenTable earns for a seat booked via it and software reservation tools. Image 3. Online restaurant-reservation service OpenTable. Search for flights, hotels, cruises, and package holidays on separate websites take too much time. With travel metasearch engines travelers can see and compare all possible options in one place. Such engines gather information from hundreds of other websites and show travelers the best offering of plane tickets, hotels, car renting services, and activities. One of the most popular travel metasearch engines is Kayak. It was founded in 2004 in the United States and acquired by Booking Holding in 2013 making money on the companies that travelers find on it. An information-only business model enriches a company with distribution and advertising revenue. 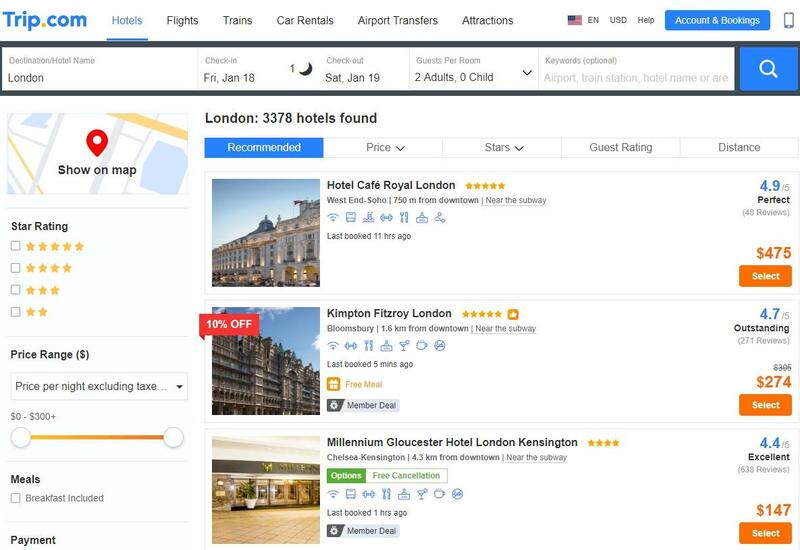 It compares hundreds of airlines and travel websites in one single search remaining free for travelers and charging a cost-per-click fee for every lead to OTAs. Image 4. Fare aggregator and travel metasearch engine Kayak. Trips to historical landmarks attract travelers who want to raise their cultural awareness getting the best price, skipping the line and get a spot on tour. Tours and activities websites assist time-bound tourists in finding specific excursions or day trips and relieve them from being exhausted looking over through the amount of research. Travelers find value in a great variety of options from traditional sightseeing tours to unique VIP experiences. Viator is the most well-known website from this category. A global online marketplace that provides thousands of curated tours and activities available for booking was launched in 1995 in San Francisco with a further acquisition by TripAdvisor in 2014. Now it is the largest global retailer of local tours and activities. Image 5. Tours and activities website Viator. We consider the features below as the most important for now in the travel business. The world is changing, and we are changing. So, our primary needs are not they were yesterday. We at Aimprosoft are aimed to help business be top tomorrow as well as today. Let’s see how to succeed with your travel website development now and later. Travel decision-making strongly depends on search. The more filtering options are available on the travel website, the easier it gets for a traveler to find a desirable option effortlessly. When a traveler visits website Trip and chooses a hotel, an advanced search allows filtering results based on star rating, price range, booking policy, location, payment, available amenities and others. So, when doing a travel portal development, don’t forget to include these parameters to make online booking experience pleasant and humanized. Image 6. 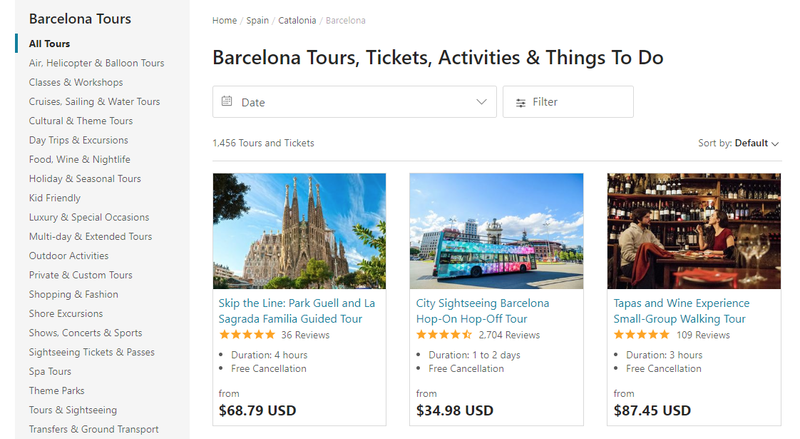 Keywords, star rating, price range and other filters on Trip. 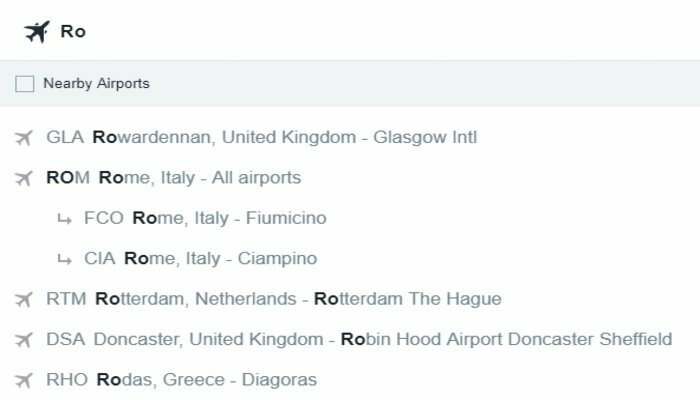 Predictive search is a simple drop-and-down menu that pops up immediately as soon as a user started typing a name of place or airport. With its help, website visitors do not have to look through an endless list of irrelevant options. They quickly find a required item. Travelers who use a mobile version of a travel website would love this feature. The standard predictive search option on Kayak totally respond to searchers. Image 7. Predictive seach on Kayak. Social networks with lots of visual content like Instagram or Pinterest are popular for a reason. People love watching beautiful photos. They inspire, enable more precise message conveying. Visual content will appeal to your travel website right with a great copy and good deals to win your visitors over. It is needless to say that for home-sharing websites high-quality photos serve as an excellent means of boosting their brand’s credibility. At the same time, the evocative, compelling, and keyword-rich copy that matches perfectly the design of your website helps to win the audience. Carefully-crafted content and expert opinion will drive a steady stream of new customers to your online travel agency or booking service. See how perfectly brand Locke manages to combine big, high-quality photos with the compelling copy. Image 8. Image gallery on design-led aparthotel Locke. When tourists are going to share someone’s couch, they need to get as much information about their host as they can. Testimonials always enhance the credibility be it home-sharing service or a tour agency. Look how excited reviews from happy couchsurfers encourage travelers to follow their example and give Couchsurfing a try. Image 9. Testimonials of happy travelers on Couchsurfing. The chances are that your clients have a list of preferred hotels or places they visit most often. In this case, the favorites list becomes a basic tool. With its help, travelers can save their time and do not need to start their search from the very beginning. Any tested flight, hotel, or holiday package will be found in a blink. Image 10. My list on Travelocity. When travelers compare similar packages, they want to see the clear difference between them and how they influence the price. Display of confusing or outdated prices, hidden charges or taxes is a sure way of losing potential customers. On Travelocity when any traveler selects a vacation package, for example, a flight+hotel, they see what services are included in the price. That is a truly fair practice to convert lead into customers. Image 11. Transparent pricing system on Travelocity. Google’s VP of engineering and shopping Oliver Heckmann notes that for modern travelers fast access to the information is not enough. What they need is a better, more personalized experience. The travel study conducted by Google and Phocuswright in 2017 shows that 57% of the US tourists agree that online travel providers should tailor content on their websites according to past behavior or personal preferences of their clients. Furthermore, 36% encourage brands to use this initiative by showing readiness to pay more for their services. Kayak, for example, offers visitors personalized price alerts and promo codes in exchange for their emails. Image 12. Personlalized offers on Kayak. Call-to-action (CTA) is a magic button or a link that serves as an instruction encouraging visitors to buy your product or to order your service in the right moment. The most popular travel CTAs are Book Now, Reserve or Check Availability. The straightforward CTA increases chances of turning a website visitor into a booked traveler. Expedia offers travelers to book a hotel room with a clear call-to-action button reserve. Image 13. A smart call-to-action on Expedia. Online travel agencies commit a common mistake when they focus only on booking services and forget about travelers who have not chosen their destination yet, and need a bit of inspiration and encouragement in this matter. The analysis of search queries will help make a relevant offer to doubtful users. Besides, you will also understand what website functionality should be upgraded. Booking.com analyzes what places tourists have been searching the most often and offers various tours to any taste from the UK’s best destinations to Australian most captivating islands. It shows how you should care about an analytical module or third-party add-on to be a part of your website. Image 14. Personalized travel offerings based on analytical data on Booking.com. Customer care on a travel website supposes any kind of help a traveler may need on any step of his customer journey. It is focused on making customer’s experience seamless and effortless. This assistance is not limited by a traditional help section with the FAQ page. Customer care is about to give a user what he needs where he needs it. 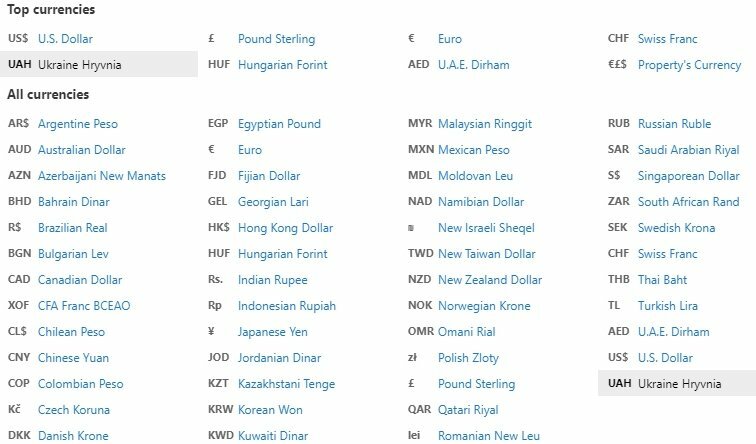 Booking.com offers a long list of available currencies to pay native for users from different countries. Image 15. The list of currencies on Booking.com. Travel blogs encourage traveling. You have no right to ignore it as a feature if you take your travel portal development seriously. When it comes to the content, there are two types of articles that perform best: listicles and educational content. Articles like “5 things you should know before going to…” or “10 places to visit in Europe this spring…” always get lots of shares. Just make sure that items you listed are unique and were not mentioned by other travel bloggers. Asking an expert on a relevant topic to write a guest post for your blog and share their experience with readers will work well for your business as well. Image 16. Preveiw of a listicle on The Culture Map. Education content does not fall behind listicles. Travelers always search for manuals, guides, and tips. Therefore, such evergreen content as “How to find cheap flights to…” or “How to stay organized while traveling” should become must-have publications. Dive your users into traveling with short videos for the best-performing posts. We are all for profit in business. When it comes to online travel market, there are five most popular business models. A company which uses this model charges advertisers cost-per-impression or-cost per-click rate. Let’s see how this model works on the example of Kayak.com. Travelers use this resource for comparing different flights, hotels, holiday packages before booking them on other websites. They choose the required location, then Hotels and Kayak display a long list of the most suitable accommodations. When a user finds something to his taste, he clicks on “View details” and is redirected from Kayak to advertiser’s page and books a hotel room there. At this point, Kayak will get money for each click even if it did not end up with booking. Owners of travel websites get transaction revenue when a traveler books a hotel or flight directly on their pages. This revenue is preferable since the commission on the booking price is several times higher than the pay-per-click rate. When a traveler visits TripAdvisor, he repeats the previous actions (enters a location, chooses a hotel, etc.). On the page with a preferred hotel, below the similar search results, there is a subcategory called “Rooms”. These hotels are partners of TripAdvisor and can be booked via the website. If a traveler books a hotel in this way, TripAdvisor gets transaction revenue. This modern term supposes displaying traditional banner ads. Hotels, cruises, airlines, and tour operators pay for such ads. The pricing model there is cost-per-impression or the cost per 1000 impressions, to be more precise. Subscription model means that travelers get access to exclusive deals only after subscribing. For example, on Couchsurfing free users have only three options. They can host international travelers, attend free events and stay with local hosts. However, the subscription gives them additional opportunities, for example, receiving SMS with address verified or ability to use the free-ad website or mobile app. An industry leader Booking.com successfully adopts a business model previously used by brick-and-mortar travel agencies. The company signs a contract with hotels in its list and gets a commission varying between 10% and 30%. The hotel size and its rank on the pages of Booking.com define the scope of the commission. Before the travel website or portal development starts, it is necessary to conduct market research and business analysis. You can take these tasks upon yourself, but it is much easier to ask business analysts of a software company do that. You may be interested in this post if you wonder how to create an enterprise portal. Well-advanced development companies know their job. You will get online travel market insights, uncover some hidden perspectives and understand how to get the advantage of the upcoming trends like m-commerce resources, web and mobile apps adorable by millennials or ways to leverage the impact of social networks on travel. Domain research clears up a basic scope of the project and helps find your niche corresponding to the goals that your online resource should achieve. Fixed functional, operational, and technical factors are a part of business requirements that will be a ground for developers on working under your website. We at Aimprosoft use a Statement of Work for this purpose. A minimum viable product uncovers a true value of your business concept for users. The MVP of travel website has basic features for a quick go-to-market. It is launched to test the demand for your online travel agency, booking or car rental service instead of releasing a long-delivering full-fledged product. With the MVP you can gather user base of the first adopters and get the insight into preferences and behavior of your target audience. You will understand better their wants and be able to build up features according to their demand, for example, a date drop-down or more convenient booking with additional payment options. The advantages of making MVP are apparent, but they are not as advanced as the ability to avoid large capital losses and reduce costs for website development for travel agency. When dealing with web design, UI and UX concepts are equally important for the success of the development of your travel website or booking service. The UI design is about the visual appeal of a website. High-quality images, carefully chosen fonts, and overall design style — all these user interface elements will catch the eye of visitors to the exquisite interior design of the hotels and call to buy a tour via your website. UX defines the convenience of your website for travelers. It shows how easy they can pick a flight or choose the next holiday destination on your online resource. A visible, simple call-to-action button with a striking text in the right place, a good site navigation system, natural booking process, and complete tourists information create the positive user experience and showcase the services your website has to offer. The design is more of convenience than colors. We recommend focussing on offer-related design in the process of online travel website development to make users take the action you want them to do. The functionality you will add has a significant impact on travel website development costs and time for deployment. When you get down to website development for your travel agency define the scope of your future project. The basic feature set of a full-fledged website includes search filters, predictive search, images, customer reviews, favorites list, pricing, personalization, call-to-action, analytics, customer care, list of hotels, extra services and blog. 1 Data Scientist if you are going to extract data from search queries. When it comes to costs, a travel booking website development of full-fledged product within 6 months will cost you approximately $400 000 in the USA, £275 000 in the United Kingdom, €300 000 in Western European countries like Germany and around $150 000 in Eastern Europe (for example, in Ukrainian companies). Planning development, you surely can agree on the development time comfortable for you and take it slow. The launch of an MVP with starting functionality that includes search filters, booking capabilities, and tools for a small amount of content, one backend and one frontend developer plus and a data scientist would be more than enough to create the project within a month. It will cost you $83 000 to hire US specialists, £57 000 to turn to the British developers and €62 000 to use the services of the Western European experts. Eastern European developers will bill $31 000 and over for their services. Lastly, concerning a programming language, Scala is a good option for the travel agency website development. Such popular brands as Expedia and Airbnb have chosen it for their websites. This choice stems from its scalability and high functionality. Besides, this language is perfect for Data Analytics. Kayak is built on Java, which is a good option due to JVM as well. Now you have got a better understanding of the online travel market, its major players and their business models. You have seen our comprehensive view of the travel website development and got a rough estimate concerning the cost of a similar project. If you need help in getting your travel website up and running, feel free to contact us, and we will gladly share our professional expertise.